Mansfield Town kept their promotion bid firmly on track by putting Exeter City to the sword with a 4-1 away victory to end a four-game winless run. Braces from Chris Hamilton and Tyler Walker got the job done at St James Park as David Flitcroft’s side picked up their first win on the road since January and made it six wins in seven visits to Exeter. The Stags are two points off the top three with their final-day game at MK Dons looking increasingly likely to be a shoot-out for the final automatic promotion spot. Stags remain in fourth place and are two points outside those automatic promotion places, underlining how important it was to win today. Tranmere Rovers kept up the chase just outside them as they maintained their fantastic run with a 3-0 home win over Carlisle United. A late winner for MK Dons gave them three precious points in a 2-1 win at Forest Green Rovers, but Bury stumbled 3-1 at home to Swindon Town and dropped from second to third place. The Mansfield side showed four changes, two enforced. Defender Ryan Sweeney was out with a sickness bug that developed while travelling down and was replaced by Ben Turner in the back three. Midfielder Jorge Grant had been battling on lately with an ankle injury in recent weeks but stayed behind to have treatment on it and was replaced by Alex MacDonald. Jacob Mellis dropped to the bench, replaced by Will Tomlinson, and there was again a change in goal as Conrad Logan took over from Jordan Smith. A welcome sight on the bench was striker Danny Rose, bravely back ahead of schedule after his double break of the jaw ahead of his final trip to see the specialist on 8th April. The first chance fell to Hamilton as he forced Christy Pym into an early save. Down the other end Conrad Logan had to race off his line to keep Donovan Wilson from opening the scoring. Hamilton was once again denied by Pym but the third time was a charm for the persistent frontman. The 24-year-old rounded the Exeter stopper and tapped home to give the visitors the lead in the 20th minute. But the lead didn’t last long as Jay bundled home a goal-mouth scramble seconds after the restart. With 12 minutes to go before half-time Hamilton doubled his tally as he finished his 25-yard run by coolly slotting home. Mal Benning’s curling free-kick went desperately close in first-half stoppage time. Exeter almost equalised through Dara O’Shea, who headed narrowly wide from Kane Wilson’s flick on. Just before the hour Walker notched up his 22nd goal of the season with a fine curling finish. 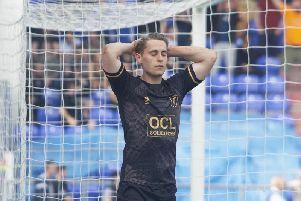 Scorers Hamilton and Walker linked up with the latter being felled by Craig Woodman in the hosts’ box to earn a penalty. And the in-form forward made no mistake from the spot to add gloss on a fine away performance. Down the other end Randell Williams’ free-kick flew over Logan’s bar.